Commercial washrooms are obliged to provide means for users to dry their hands, and electric hand dryers are the most efficient way of doing so. Not only do they eliminate the waste that comes with paper towels, hand dryers also dry hands quicker, reducing queues in toilets. Envirotec offers electric hand dryers and high-speed hand dryers for sale to commercial clients across Yorkshire and the East Midlands from our branches in Sheffield, Nottingham and Leeds. If purchasing a dryer is not for you, we also offer hand dryers for lease, with hire periods suited to your convenience. Their brushed steel housing means they slot into any decor easily, and their low-power, high-speed drying ability means that waits are reduced in your washrooms without users having to compromise on their hand drying. For those with tighter financial constraints, the value range dryer offers excellent efficiency with a power output of 2100W, and it’s available in white, chrome and brushed steel finishes. For more information about our range, including our metal hand dryers, please get in touch with us today. Combining high speed hand drying with efficient low power draw, these powerful dryers offer energy-conscious users an ideal ‘eco-dry’ solution. Perfect for high traffic washrooms, this range offers a speedy hand drying time, as well as a robust yet stylish brushed stainless steel cover, making them a stunning addition to contemporary washrooms. A range of dryers with either manual or automatic options, available in classic white or chrome finishes, these unit have an adjustable air flow nozzle for hand drying or face drying. Our units come in a range of power outputs from 2000W -2400W. Available in white plastic, white metal finishes or brushed stainless steel. 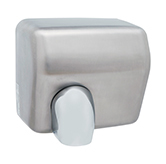 This range of high quality, reliable automatic hand dryers offers great value for money. With a power output of 2100W.